On one computer, log files showed that Regin originated from Yahoo! Instant Messenger through an unconfirmed exploit. The exact method of the initial compromise remains a mystery, although several theories exist, which include man-in-the-middle attacks with browser zero-day exploits. For some of the victims, we observed tools and modules designed for lateral movement. So far, we have not encountered any exploits. The replication modules are copied to remote computers by using Windows administrative shares and then executed. Naturally it means the malware must be run through administrative priviledge... which makes me thinking about the real initial vector.. The reality is that no reproducible vector has been established as Symantec released its findings, showing just how incredibly sophisticated this malware threat is, with custom modules able to be deployed at will to change attack vectors and go after targets with razor sharp accuracy. We might consider this Malware one of the most complex Malware ever released (for the tim being), even more complex than Duqu or Stuxnet. Some pieces of code have been written in 2003, most of them are still encrypted and undisclosed.This is another scaring factor.If you don't believe me and you want to try your own analysis please feel free do download some samples of Regin malware from here (the password is: "infected"). If you have some troubles in finding the file feel free to drop me an email. WireLurker, a shock in Apple World. 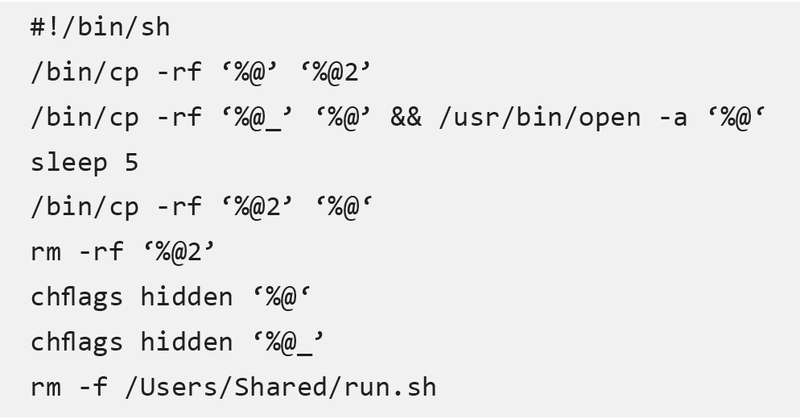 Of known malware families distributed through trojanized / repackaged OS X applications, it is the biggest in scale we have ever seen. .
WireLurker was used to trojanize 467 OS X applications on the Maiyadi App Store, a third-party Mac application store in China. In the past six months, these 467 infected applications were downloaded over 356,104 times and may have impacted hundreds of thousands of users. 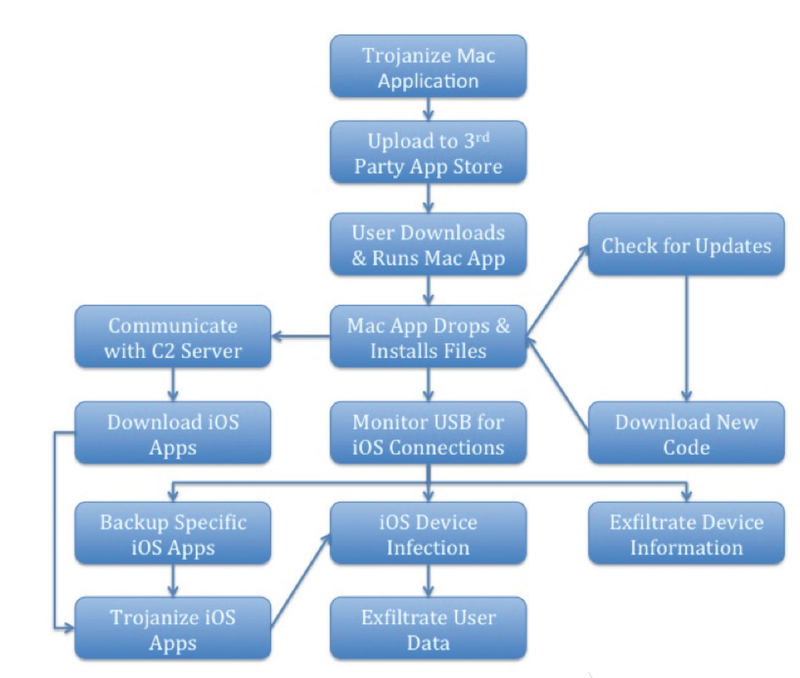 The following image shows the complete infection workflow. 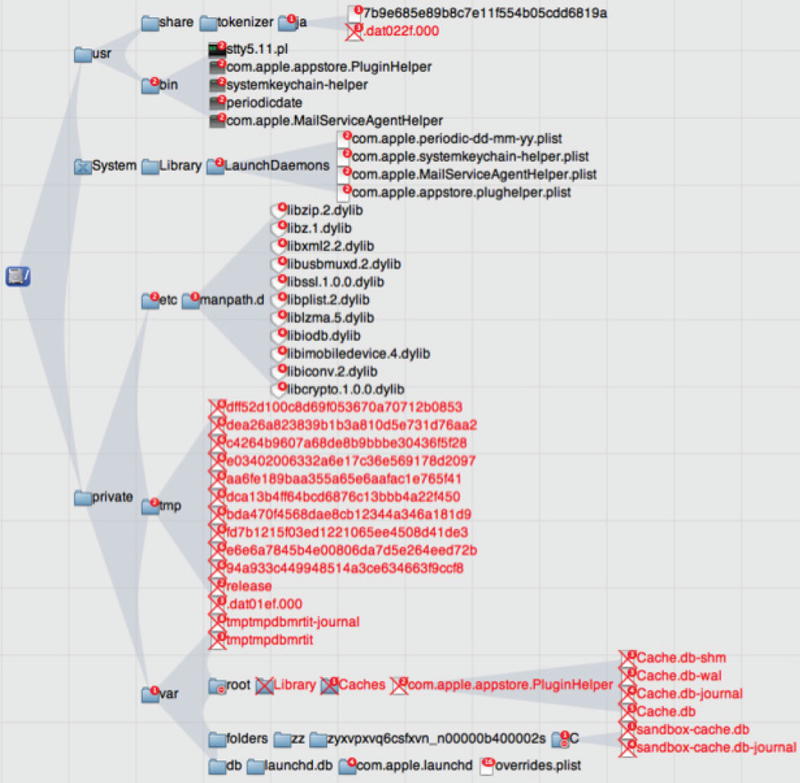 Fascinating how simple is the thechnique used by the Malware writers to Trojanize a legitime APP. Please substitute %@ with real paths to make sense on it. Once the "Trojanized App" has been saved on the infected machine, WireLurker builds its own "empire" by downloading applications, updating itslef and hiding files into folders spread on the file system. The following image shows the amount of dropped, created, deleted file into the targeted machine. It does not check if the device is already infected, each time it executes malicious code. This is actually a weak point. Detectors might exploit this behavior to identify it. It is not really "silent" adopting this "forcing method"
WireLurker initialization and update scripts create and load launch daemons, ensuring persistence after reboot. Pretty simple approach if compared to complex Bootkit Malware who does not initialized a direct daemon. Comunication to Command and Control happens by using a Data Encryption Standard (DES) with Cryptographic Message Syntax Standard (PKCS7) padding. Researcher from PaloAlto Networks figured out that for each piece of TCP data WireLurker receives or sends, the first 10 bytes of the data are used to generate a session key. The session key is then combined with a fixed string, “dksyel”, to generate a decryption key. Remaining bytes of the data are encrypted data that has also been encoded using Base64. From here the analysis is quite usual. The ultimate goal of the WireLurker attacks is not completely clear. The functionality and infrastructure allows the attacker to collect significant amounts of information from a large number of Chinese iOS and Mac OS systems, but none of the information points to a specific motive. As infected devices regularly request updates from the attackers command and control server, new features or applications could be installed at any time. It’s clear the tool set is still undergoing active development and we believe WireLurker has not yet revealed its full functionality. It is a quite weird behavior. Right now I do not have enough elements to understand the goal of such a targeted attack. Having a general information about Apple device owners seems to me a quite original target per se. For shure the security perspective for Apple users have been deeply changed.